Tomorrow is the deadline for mailing out the first part of the For Love Not Money collaborative postcards, but since the post office is closed on Sundays, the deadline was effectively today. I picked a good copy of the card, addressed it, and stuck on a few stamps from my collection of no longer first class postage stamps. 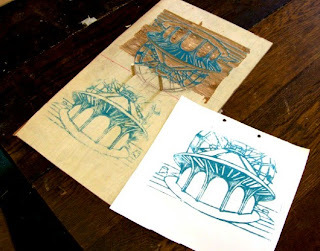 The result is more than needed, but I like the idea of the stamps being a couple of artists and an ocean going sailing ship- kind of sums up the whole project. I bundled up and walked it up to the Ocean Grove post office. 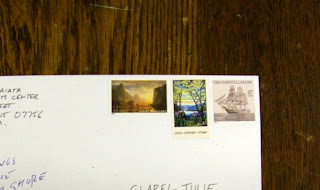 Today's postal clerk again confirmed the cost of getting my mail to Mauritius (and seemed excited to be sending it to a place she had never sent mail before), and postmarked it. My part of this card is done. Walked back to the Studio and decided to crank out a few more postcards. I had eight left of the sky-only cards, meaning I'd just have to print the other parts. I pulled out the saved color inks and decided I'd go as far as the supply would last me. My cracked glass plate was actually holding together better (and it didn't have to be moved once I set it on the block) and retained the stains of all the colors from the previous printing. I painted the four colors with brushes, placed on it a stencil (see above) to protect the sky areas from today's ink, and then added the paper and rubbed. 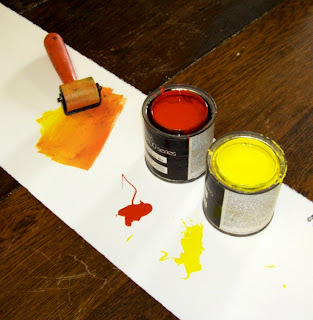 The process was repeated five more times, by which time I had completely exhausted the green ink, and was nearly out of orange and brown. But now I had six more cards ready for the last step. The relief print will be added next week, which will bring my total of extra cards to a dozen, plenty to spread around to adventurous collaborators. The color monotype proof that I had at home was mostly dry, so I decided it was a good day to move on to the next step, overprinting the color with the key block. Typically this is done with black, but I wanted to leave the possibility of my collaborator being able to add darker colors to my design, so I mixed up a color somewhere between slate blue and navy blue. 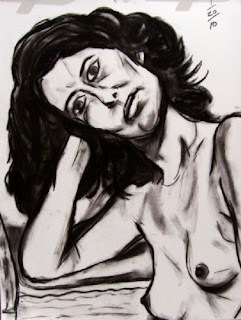 I rolled it onto the block, put one of the monotypes face down on it and rubbed the back of the paper. A typical result is shown above. I repeated the process with the other 9 proofs I had from Saturday. The two examples above are the same ones shown last time, but now with the key block printed on top. The colors are a little different (value/hue/consistency of application) in each, due to the variable nature of hand painted monotypes. That variability also extends to the colors sometimes not quite matching up exactly to the key block borders, but that was expected. 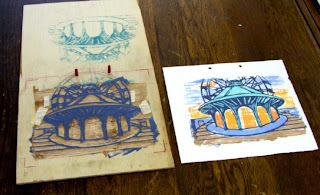 Kind of reminds me of some of my earliest woodcuts (my Montclair State years) when I took a more experimental approach. Some of the people in our critique group have actually suggested I let more accidental effects happen. When I return to the boardwalk series I'll also return to my careful watercolor system, but sometimes it's nice to try something else. I left everything to dry. In a few days I go back and trim them down to the exact required size. At that point I'll choose which one I'm sending, address it, and send it on its way. Picked up where I left off a few days ago, playing with monotypes. I had saved the two orange colors I made last time, and mixed up some new blue, green, and brown. I had one concern- I noticed a crack in the 8"x10" glass plate that I had used for the last batch of monotypes. For the moment it was just in one corner, and I figured the masking tape around the edges would hold if I was careful, so I decided to see what I could do. I started out this time doing all the colors for the whole design. I painted the sky colors first, lightly blotted it with newsprint to lighten the color, then added all the colors of the building, boards, and water. (see above) Made sure the plate was properly lined up over the cut part of the block, and used the pegs to register the paper. I started just using light hand pressure to rub the paper, checked the results, then used a wooden spoon to print any spots that I missed. I did six proofs this way printing all five colors at once (top photo in above image), then decided to test the registration system by printing the building and ground areas into some of the sky-only prints from last time (bottom photo). Meanwhile that crack gradually crept further diagonally across the glass. I produced four proofs on sky prints, the last two with the glass completely cracked from corner to corner, only held together by the masking tape borders. 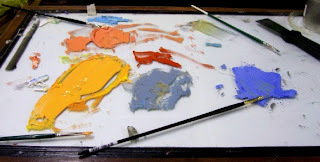 I'll have to bring a new piece to the Studio- if not to make more monotypes, then to make another portable ink palette. Meanwhile I have ten proofs to work with, enough that I'm sure to get at least one successful final result. 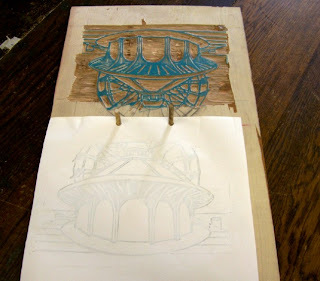 I'll let the ink dry a few days before before I attempt the next step, printing the key block over the color. Running around with a bunch of afternoon errands, but I could squeeze a couple of hours in the Studio in between some other things. I realized after I got there that I had left some of the color relief ink I had at home, leaving me a few colors short of what I need for the whole card. What I did have was enough for what I had thought about using for the sky, so I decided to try some experiments. 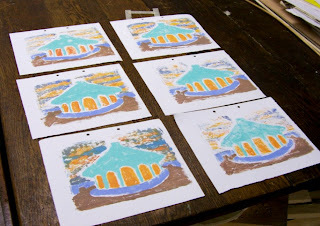 I mixed up a few colors, using a combination of silkscreen and relief ink, powdered pigment, and an ink additive. To create the monotype I used a piece of glass (my small portable ink palette), which I placed over the cut block in a fixed position- hard against the pegs with the corners marked. 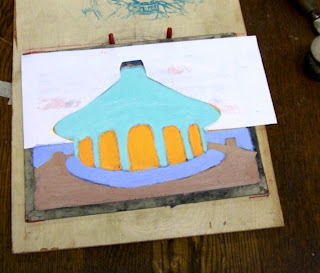 I then painted a colorful sky on the plate using brushes, slightly overlapping the edges and the building. I wanted to leave space to add the building later, so I cut out a stencil in the shape and placed it over the proper spot. Then a piece of the card paper with the punch holes was fitted on the pegs and down on the plate. Carefully hand printed it. The above photo shows the result. I produced a bunch in this way, some darker, some lighter. Next time (with my full set of inks) I'll probably try some with the full color over the whole card, but I'll save today's output for further experiments or in case I need them. The past couple of days have been devoted to school, much of which meant time on a computer. Updating some previous syllabi was a short task. Preparing to teach a brand new class was another matter. And not a studio class, but an art history survey class. So I've devoted a lot of hours over the past few weeks to reading the textbook (new to me), and yesterday was a marathon of reconciling the structures of the class as taught by other faculty at the school (no two the same) to what I had in mind and coming up with a whole new syllabus. Was at the keyboard a lot of hours yesterday, but it all got done on time and early enough to get my usual night's sleep. Downloading these documents at school today was more of a challenge, with the university's computer networks intermittently functioning, but with much effort I finally got them out of the computer and made copies for the students. 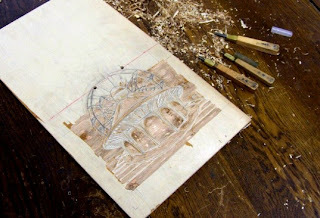 (at one point I was considering whether it would have been faster to cut the syllabus into a block and hand print it as a large edition) Classes themselves were the typical first day experience. So tonight it was a treat to step away from computer, textbooks, and piles of classroom materials, and to pick up a hunk of charcoal and some clean white paper. A small crowd at the Belmar figure group tonight, but that just meant more options as to where to set up. Despite the sometimes frantic pace required in drawing a limited time pose, I tend to find the process relaxing. The 40 minute drawing above was my best of the night. This week I'll have occasion to pass within a mile of the local giant discount art supply store, so I figured it would be a good idea to see what I have and need in the area of color ink. Normally I do my coloring with watercolor, but that might not survive the twin perils of international delivery and whatever process my collaborator uses on the card. So ink it will be. My ink supply includes several old cans of oil based silk screen ink, which I picked up for like 75% off many years ago. Nasty stuff, which is why it isn't made anymore. But the colors are very bright and it is designed to dry quickly. I opened up four colors that might be useful. The lemon yellow and fire red (seen above) were completely separated, but a thorough stirring brought them back to life. 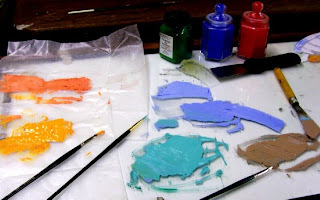 On the other hand, the blue and green were also separated but the pigments were a solid block I couldn't break apart. I do have some tubes of blue and green oil relief ink, and some powdered pigments, so I think I'll be ok.
With that settled, it was time to go back to the block. Today's plan was to offset the image a few times to create registered color blocks. The image I carved yesterday is known as a key block- it includes all the lines and dark areas that will print over everything else and tie the different color areas together. 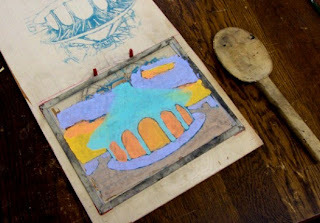 Traditionally the key block is cut first, and prints from it are used to create the other color blocks. First step was to cut some pieces of slick paper to size and punch the registration holes in them. I inked my cut image with some waterbased ink, placed a piece of paper over the pegs and onto the block, and printed it. Then I quickly removed it, rotated the block, and placed the proof back on the pegs but on the other half of the block. 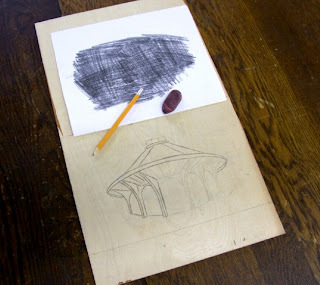 (see above) I rubbed the back of the page with the same tools that I used to print it, but now I was transferring the ink from the paper back to the plywood, a process called offset printing. 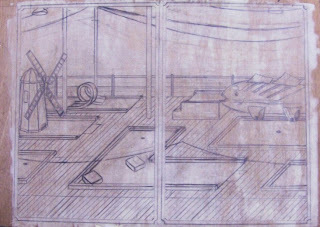 The two step process results in a double reverse, with both the original block and the second image on wood being oriented the same way, and in this case both registered to the same set of pegs. I repeated the process two more times, using the same drilled holes and pegs and making two more versions of my composition on the back of the block, as seen below. These images are not as bold and sharp as the paper proofs that created them, but include more than enough detail to allow me to cut them for different color shapes. Before I do that, I have to decide how many different colors I want to print and how they will be distributed around the composition. Given the close deadline I have for finishing this, my busy schedule (school starts up again for me this week), and that I only need one copy by the mailing deadline, I may try something different and more direct- a color monotype background overprinted with the key block relief. I have a few days to consider my options. I brought the block home with me last night so I could work on it next to my digitally stored references. This morning I did that, reworking the ferris wheel a few more times, but eventually getting something I could live with. 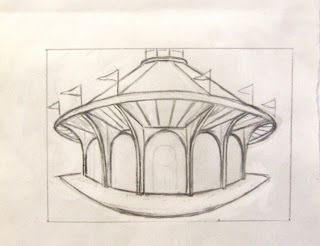 I also used one of my photos of the carousel building to add a few details, including some shading. In the afternoon I brought it back to the Studio. In one 2.5 hour session I cut the whole block. 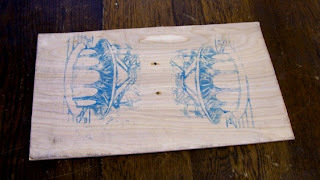 Might have even finished a little sooner if not for some tough knots under the veneer of my board. I decided to cut it a little beyond the specified border size; I'll bleed the image and trim it to fit the required dimensions. Still a whole lot of things to work out, but getting this first part finished was an important step in the process. My part of this project has to be in the mail in two weeks, which means that I have to get going on this block. I decided to use birch, which costs a little more than my usual lauan, but it will allow some finer detail and it will be easier to print the flat color shapes off it. I'm going to use a peg registration system, a variation of something I first worked with back in Carbondale. 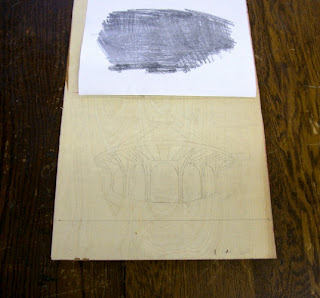 Today I started by cutting a piece of wood large enough for two pieces of the whole print. On a center line dividing the two halves I marked and drilled two quarter inch holes. These holes match the spacing of a two-hole paper punch. Along with some short dowel pieces, this will be my registration device. The next step was to take a photocopy of the sketch I made earlier in the week and cover the back with graphite. This was accomplished by scribbling with a soft pencil. This sheet was taped face up onto the board, as seen above. The next step was to use a harder pencil to trace all the lines of the original drawing, pressing firmly with my pencil. After this was finished, I lifted the sheet to find that my homemade carbon paper had worked and a faint but readable version of my building sketch (see above) was now on the board. Next, I used a pencil to redraw over the transferred image, making some fixes along the way. The above photo shows the process about halfway done. 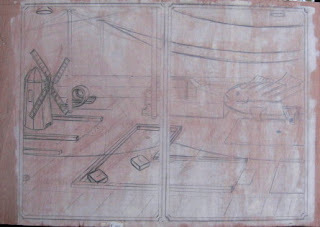 With the building part done, I could turn my attention to the other parts of the composition. 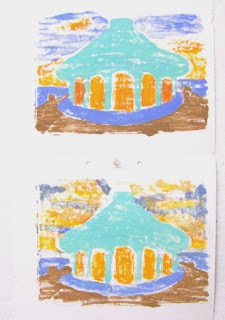 I had been using photocopies of Tuesday's sketch to work on some other ideas, some of which are seen in the above image. To be able to include water in the scene I relocated the building from the land side of the boardwalk to an amusement pier (common enough on boardwalks in New Jersey and elsewhere) extending into the ocean. I don't know if the "Palace of Fun" will make it to the final version, but for now it's on the circular walk around the building. The plan also calls for a ferris wheel in the background. I spent considerable time this afternoon trying to draw one (based on sketches from photos), but so far the perspective has been off. What you see above is the best version so far, but it will be redrawn. The upper part of the wheel is just for working out the shape and proportion of the whole wheel and won't be part of the final card. 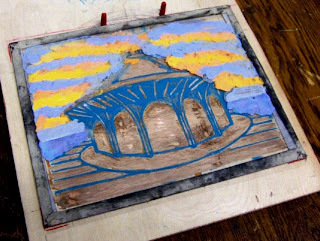 As I said yesterday, I was leaning toward using an image based on the old Asbury Park carousel building as the basis for my postcard project. As it's still way too cold to go wandering around Asbury's boardwalk doing sketches, I decided to use one of the many photos I had taken of the building as my source. And if I didn't have any of my own (such as the one above), I could have found several thousand on the internet. So, sitting in my nice warm house this morning, I did the above sketch, to familiarize myself with the main architectural structures and proportions of the building. 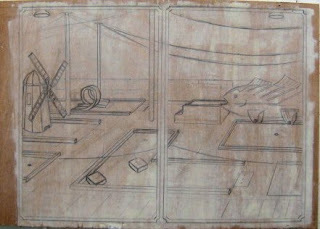 I brought this sketch to the Studio, where my next step was to build myself a little cardboard model of the building. I used this to help work out the exaggerated perspective that I had in mind. 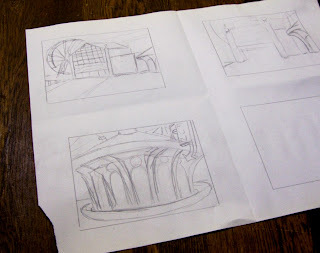 Next, I laid out a box of the exact dimensions of the final card and did a sketch of my version of the building, similar to one of yesterday's sketches. The biggest change I made from the actual building was to cut down its width to fit the proportions of the card. That meant reducing the number of arched doorways from 7 to 5, but allowing them to be bigger. Works out better for the idea of the image, even if it's not completely accurate to the original. 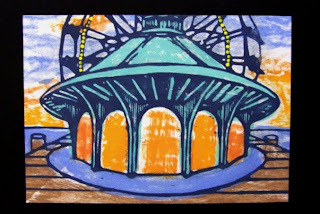 (if you prefer more accurate depictions of the carousel building, you'll have no trouble finding them in galleries all over the shore area) I still need to play around with the background, which will likely be some large amusement park rides as planned. But that can wait for tomorrow. 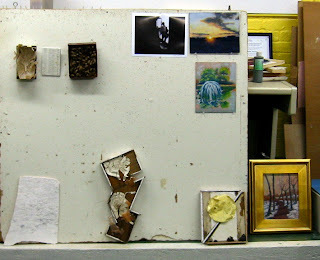 My second Studio task of the day was to continue work on the international postcard project. Having spent some time considering the sketches from a few days ago, I had a few ideas where to go. (or at least where not to go) Shown above are the two best options of the moment. 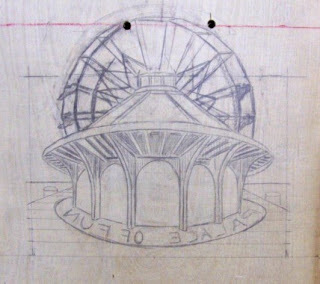 The top sketch is a condensed version of one of Asbury's most photographed landmarks, the derelict Casino/Carousel building, with a ferris wheel (and maybe some other amusement park rides) in the background, along with a little sliver of beach. 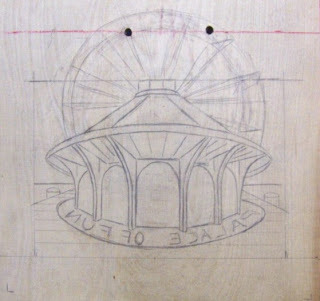 The bottom sketch is a simplified version of the Carousel building in close up, again with amusement rides seen in the background. I'm leaning toward the latter option at the moment- the close up building would allow more detail, and the doorway niches could be interesting locations for my collaborator to add images. I'll try to develop one or both a little more in the next few days, then make a decision. Put in a few hours in the Studio this afternoon. First up was the new boardwalk block. A few minor changes and additions. 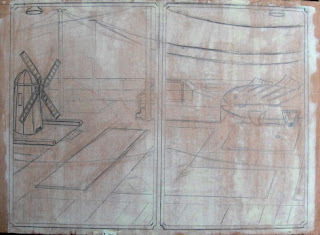 Most obvious is that I roughed in a whole lot of diagonal lines, representing the boards of the boardwalk. As expected, the pattern emphasizes the flatness of the composition. Less obvious was that I moved the overhead wires up, to put a more logical distance between them and the ground plane. The curves need work, but the location is fine. I'll add the light fixtures after I have them finalized. Just before Christmas I was contacted via e-mail by my Mauritian collaborator in this big international For Love Not Money project. An introduction, a little bio (25 year old art student) and just making sure I was on board. I sent a reply a few days later, also asking if there was a preference in how to divide up the work. I offered such possibilities as half and half, creating elements to work around, or producing a background. A response came back a few days later, asking me to produce a background to be printed over. No problem. So what to do? To be true to my artistic style I wouldn't want to do a simple geometric/abstract background. No, it will have to be a scene of some kind. Earlier this week I put the question to the critique group. The quickly achieved consensus was that it should be something related to boardwalks. It makes sense. It's obviously an area of interest for me. The core concept of my series (the seeking of transient pleasures of life) fits in easily with the parameters of the overall project. My counterpart's homeland seems to be a classic tropical island and has many resort beaches, so the concept shouldn't be too alien. I thought about it a bit over the past several days. Since whatever I do will be partly printed over, it shouldn't be too dark, so I'll be skipping the black ink, just going with pale colors. I'm thinking 2 or 3, maybe even doing it as a reduction print. But before I deal with that I have to come up with a design. 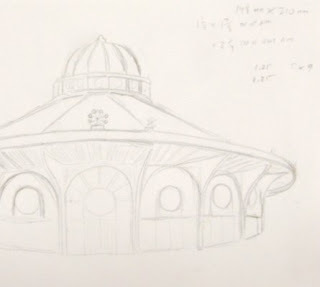 My boardwalk project has set me up with dozens of photos and sketches of boardwalk scenes, so I spent some time looking through those, making notes. Then up at the Studio today I took some of these pieces and played with various compositions at the approximate scale of the card. Some examples can be seen in the above photo. 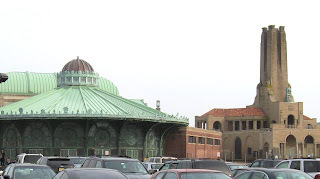 Most of them combine bits of pieces of architecture from Seaside and Asbury. (Locals here might object to these imaginary juxtapositions, but I figure no one in Mauritius or Estonia will know or care) None of the eight compositions from today are likely the answer, but they may point the way. With various perspective inconsistencies apparent in the current boardwalk block, I figured the best way to resolve it was to go back to the beginning, which in this case is that original 1972 photo. 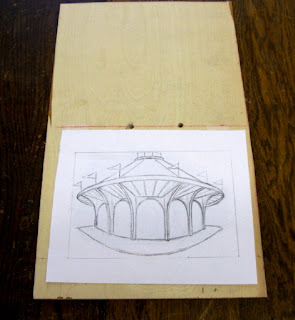 What I found was that the angle of the boards in the photo changed far more across the composition than I had drawn. And it didn't help that I was trying to line up some things with the boards that weren't oriented as such in the photo. I saw two options- completely redraw almost all of it to match the photo's perspective, or adapt what I had to another form of perspective. Pre-western influenced Japanese art often made use of perspective systems different from the one and two point systems favored in the west from the Renaissance forward. One of those is an isometric perspective, in which all major lines are vertical or parallel angles of 60 degrees to either side. An example can be seen in the above woodcut by Shunsho. Much of the arcade print in this series uses this approach, with the exception of the upper parts of the skeeball lanes and some of the upper prize shelves. 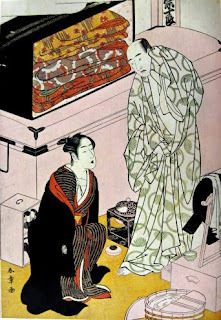 Another system common in older Japanese art (including some Ukiyo-e prints) is oblique perspective, in which all the major lines are vertical, horizontal, or 45 degree angles in one direction. 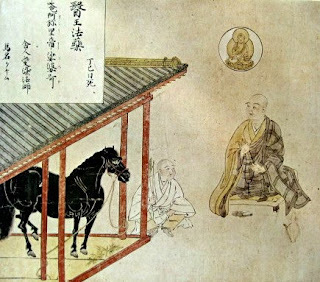 An example of this can be seen below in the painting by Bai Zoshi. Since a lot of my block drawing was more or less doing this already (and the rest wasn't working particulary well) I decided to convert my drawing to this oblique mode. Or a modified version anyway, since everything in oblique perspective is the same scale, but in my composition things will be smaller as they recede into the distance. While redrawing all straight lines with only 3 possible angles was not mentally complicated, the effort of making sure everything was parallel to what it should be did take a few hours. The results are below. The new version raises the point of view a bit higher (something inherent in isometric and oblique systems), which means I'll have to lose a bit of the sky and adjust those overhead wires considerably. I may have to make some adjustments to the fish and windmill as well, but I'll spend some time looking at it first. As I stated in my New Year's summary, I don't have much on my exhibition schedule for the coming year. I'm hopeful that things fill in soon (as they typically do more years than not), but for now I have two likely shows coming up. One will be For Love Not Money coming up later this year, which is expected to be on display at the 15th Tallinn Print Triennial in Estonia (as well as Australia in 2011 and maybe a few other locations in between). But before then will be Where Have We Been?, also known as the 35th Annual Member's Exhibition at the Printmaking Council of New Jersey. In the past this has usually been a juried show, and while I've always made the cut, I would have to wait for the juror notification to know for sure. However this year it has been decided to make it open to all members, with everyone permitted to submit up to three prints and an in-house committee choosing at least one from each participant. 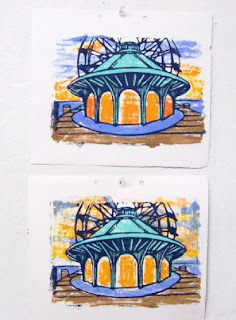 The theme calls for the work to be from the past year, and for me that means prints from the boardwalk series. So this afternoon I wrote up a little statement about the series, and e-mailed it to PCNJ along with the three images. They also still need a hard copy entry form, so I took a stroll to the post office to send that on its way. I'll be informed which piece(s) will be in the show in early February, with the exhibition opening in early March. Of course if something else comes up before then, you'll hear about it right here. Another night of drawing in Belmar, with seven of the regulars participating. I regularly show you the results of what I do there, but for a change I'm putting up a photo of how things look from the model's side of the room. Lucky for her the building's heating system works well, because the weather around here has made it above freezing for only a few minutes of the last three weeks. Below is my version of the pose everyone above is working from- charcoal, about 40 minutes. Just a few days ago was the 4th anniversary of the deal to move Studio Arrabbiata to the Jersey Shore Arts Center in Ocean Grove. On that day after New Year's Day in 2006 I met Molly for lunch and she presented her plan for us to join forces to create a useful workspace for both of us, as well as become a center of printmaking for the Shore region. Today we had another lunch, but it served a few other purposes. Molly and I decided to exchange some of our experience and knowledge to help each other with some arts related tasks. 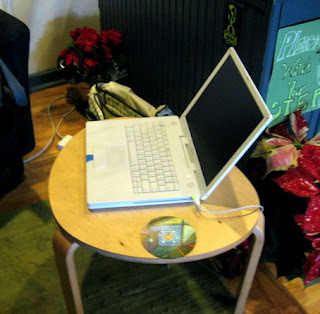 These would require her computer and the internet, so we decided to meet at a coffee shop in town in the morning. First was a discussion of the art history class that I have been assigned for this coming semester. I have covered the material before in other situations, but this is the first time that I'll be teaching the class at one of my current schools, while Molly has taught that class many times. So she pulled up her most recent syllabus, examples of an exam, study guides, her notes, etc. Not the whole semester's worth, just enough for me to see what kinds of things she does with her class. I won't be following her exact system, but I may adopt some of her ideas. After that we got onto the internet and I showed her how to set up a blog of her own. Her previous website hasn't been functional for a few years, and people have been urging her to get some kind of web presence and this seemed a quick, easy, and inexpensive solution. In our limited time we got as far as setting up a basic blog and going over a few basics of posting and editing. It may be a while before she has it fully set up, but she should be able to take it from here. 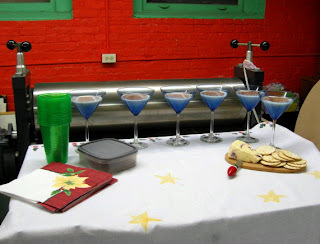 Then with the work done, it was time for another tradition, our annual studio staff Christmas party. Our teaching schedule, the snowstorms, and various family obligations prevented us from doing it in December, but pizza and beer are always in season. We went around the corner to the Squan Tavern, split a large pie with sausage and peppers, and toasted to our four years in the coolest print studio in New Jersey. I arrived at the Studio this evening for the January critique night to find Molly hard at work on making more of her birds, and this lovely spread of tasty treats from Mary, including some special egg nog. We had 11 artists show up tonight, with 9 of us bringing art. A little bit of all of it can be seen above. I had the current boardwalk block, and also sought some opinions regarding my upcoming international collaborative piece. 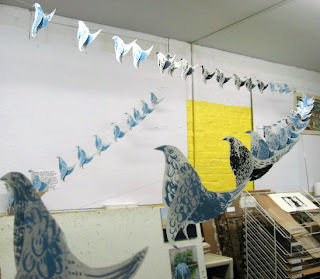 Molly put up dozens of her birds, strung on threads across the Studio. 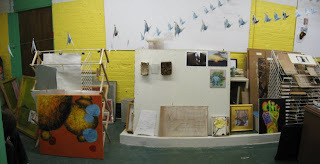 Below are sculptural pieces from Adam and Jane, paintings from Edy, and a photo from Tim. 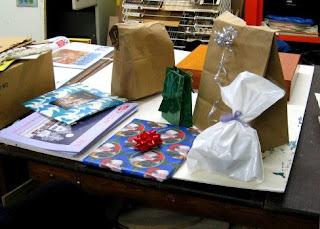 At the end of the critique half a dozen of the artists participated in a gift exchange. All the gifts were handmade art, small works pretty much in the medium of each artist. Some pieces were coveted by more than one participant, but everyone walked away with something nice. Had some free time in the afternoon so I was able to devote a few hours to the current block. The most obvious changes are that I did make the platform in front of the bluefish much smaller, and was able to extend the hole with the loop further out, which allowed me to redraw the loop a little further to the right, so it's not overlapping the windmill blades. Perspective is still all over the place, so I have to come to some kind of decision as to what I'm going to do with that soon. I presented the block in this state to tonight's critique group. 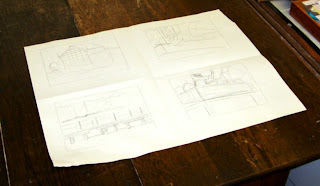 The perspective question was raised by Molly, mostly because she knows I tend to like a certain consistency in my work. Adam asked about open space in this print, and the series as well, in relation to traditional Japanese prints. (such things are found in many Japanese prints, but just as many have compositions like the ones I've done so far) As for the statue, Jane suggested another pig (and favored something scary/creepy), but I'm still considering some options. I like to get working on something early in the new year, get things off to a good start. I was mostly at home today, and my current boardwalk block is still there, having come home with me a few weeks ago. That means I've had a lot of time to look at it and think about what needs to be done. The top photo shows what the whole block looked like following the last time I worked on it. The thing that I felt needed addressing most was the golf hole in the middle, the L shaped one. The plan for this one is to have a large figure sculpture straddling the corner of the L, requiring players to hit the ball through the legs, and bounce at a right angle toward the hole. 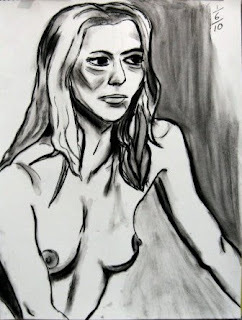 In my original rough sketch I had this figure more or less in the center of diptych, so it would be split between the two halves. In that rough sketch I just had a single pencil line stand for the break between panels. The problem is that when I moved over to my formatted block, that line was now a 3/4" inch stripe right up the middle of the figure, obscuring most of it and just leaving some unexplained limbs extending into each half. Plus it puts a possible focal point right in the center, which makes for a dull composition. So after weeks of thinking about this, I came up with a new plan which started today, sketching in between favorite episodes in the traditional New Year's Twilight Zone marathon. 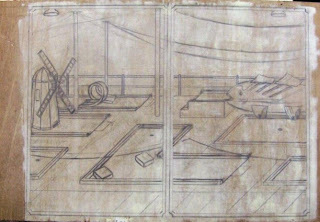 I removed the rectangular section between the L and the windmill hole, extended the windmill green out a little, and moved the left side of the L to the left, so that both of the squarish foot bases are in the same panel. The net result is the loss of one golf hole, but the spacing between the holes is now more practical. And it moves that big figure off center (left on the panel, right on the eventual print). I made a few adjustments to other holes, though the outlines of all may change as I continue to fix perspective and spacing issues. I added one significant item, the looping obstacle in the center of the left panel, just beyond the windmill. I'm pretty sure that I will be changing the platform structure that leads into the bluefish mouth. It occupies a lot of space in an uninteresting way and it's not easy to join it to the perspective of the rest of the scene. I want to think about it for a while, but it's probably going to be shortened and made into a simple platform without all the covering panels. The only other big thing is coming up with a specific idea for the large figure on the L shaped hole. Some things being considered- a generic cartoony animal, a figure based on an obscure old comic book/cartoon character, a cheap knock off of a well known cartoon character, something that is supposed to be funny but is unintentionally scary/creepy, or some combination of the above.